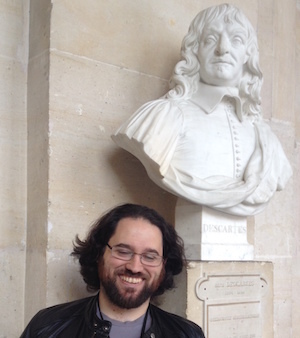 With Descartes at Versailles circa 2015. Since the fall of 2018 I’ve been an Assistant Professor in the Philosophy Department at the University of California Davis. Prior to that I was a postdoctoral researcher in the Netherlands, working with Professor Catarina Dutilh Novaes on the Roots of Deduction project at the University of Groningen, where I worked on various connections between proof-theory and dialogue games. Prior to my stay in Groningen I worked with Greg Restall and Jen Davoren at the University of Melbourne on creating the, seemingly no longer available, MOOCs on Coursera, Logic: Language and Information 1 and Logic: Language and Information 2. I did my PhD at Monash University in Australia under watchful eyes of Lloyd Humberstone, working on translations between modal logics. My research is focused on issues in philosophical logic and the philosophy of logic. I’m particularly interested in philosophical and technical issues concerning modal logic, translations between logics, proof theory, non-classical logic, and the semantic paradoxes. I’m particularly interested in questions concerning the philosophical significance of translation results in logic, and problems and prospects for substructural, particularly nonreflexive and nontransitive, resolutions of the semantic paradoxes. I’m generally interested in any area of philosophy where formal methods can be fruitfully applied. I drink a lot of coffee (I recommend Temple Coffee Roasters if you’re in Davis, Black & Bloom if you’re in Groningen, and Market Lane Coffee if you’re in Melbourne). This website was created using Hugo and Kube, is typeset in Alegreya. CSS ideas are shamelessly taken from consequently.org and Kieran Healy.